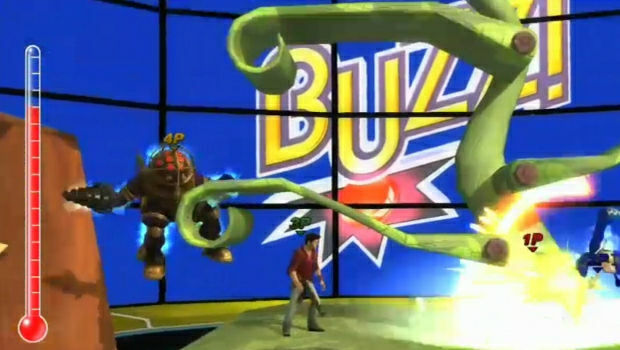 With every new character unveil, I become more excited for PlayStation All-Stars Battle Royale. Now that the Internet has had a couple of weeks to fight over whether it's a soulless Super Smash Bros. clone (it isn't), Sony has made it easier to cheer for their whimsical four-player fighter with the addition of two new characters. Now the game has a character from what is arguably the PlayStation 3's flagship series and the first third-party character to be added to All-Stars' roster. I didn't expect Big Daddy and Nathan Drake would fit well among the cast of mostly bright, cartoon-like characters, but I am wrong. So are you if you were thinking the same. They are easily my favorite characters in the game so far and they fit perfectly. 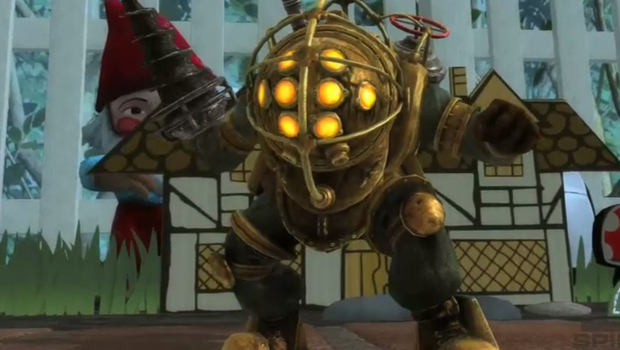 Chibi Big Daddy for the win. Bringing a gun to a slap fight is always a difficult proposition for a fighting game, so I was a bit skeptical of how Drake would fit in among melee-focused characters like Parappa the Rapper and Kratos. As it turns out, Drake is perfectly competent at close-quarters and mid-range combat. That shouldn't be a surprise if you've played Uncharted. I just didn't think Sony would pull it off. As Drake, you can pummel enemies up close with some fierce-looking hand-to-hand blows, fire guns in all directions, and quickly traverse areas by magically summoning a zip line to ride. Drake feels really agile and his wide arsenal of weapons gives him a lot of depth. You can fire a shotgun into the air, an Uzi downward, and a silenced pistol to your sides, and toss grenades for extra damage. The way Drake moves around is unique and gives him a steep learning curve (which I love!). Using a zip line feels awkward at first, but once you learn how to position it to your advantage, you can get the jump on your opponents in creative ways. My absolute favorite thing about Drake is his bizarre cover system. By pressing down and circle, you can call forth cover and hide behind it. You can take potshots from it, or jump to the other side and do some melee moves. There is something hilarious about seeing Drake fire a grenade launcher at Fat Princess. Level 1 - Propane Tank: Drake tosses a tank and shoots it for a small area-of-effect explosion. Timing and positioning is key on this, as it's very easy to miss your mark or fire too late. Level 2 - Ancient Pillar: Drake summons an ancient pillar that crumbles across the screen. It has a very small range, but deals a lot of damage. Level 3 - Weird Zombie Thing: Drake turns fighters into zombies, whom he then can one-hit-kill with a golden gun. 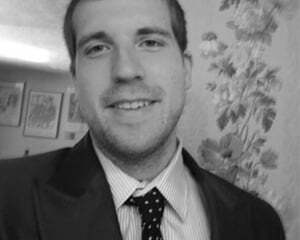 Players can still move, but only at a zombie's pace. It's in his name: BioShock's primary baddie is a big, lumbering mess of steel and measured rage. Cramming him into a fighting game, though intriguing, seemed like an unwise move on Sony's part, but the developers have done an admirable job of making him fit into All-Stars. Big Daddy is a bit smaller and far more agile than his FPS incarnations, but he still feels like the character we know and fear. He can dash across the screen, a move that keeps him shielded from enemy attacks, or use his drill for a powerful melee attack and a variety of plasmids for mid-range damage. Shocking an enemy, dashing into them, and then ramming them with your drill is a lot of fun. Though Irrational Games didn't touch All-Stars, Sony has wonderfully captured BioShock's signature character while making him a wee bit smaller. Level 1 - Syringe Attack: A Little Sister comes out and stabs an enemy with her giant syringe. Level 2 - Rage: Big Daddy lights up red and goes into berserk mode, dealing extra damage. 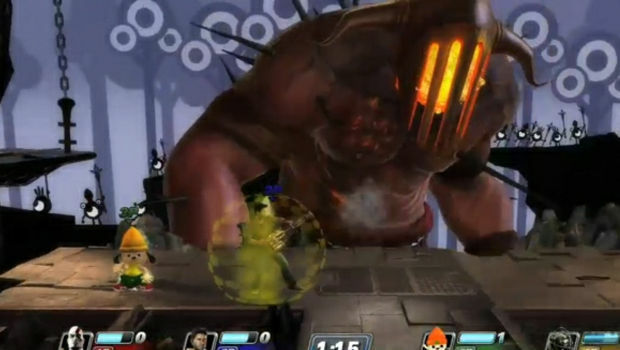 Level 3 - Flood: The stage floods, bringing players to a standstill while Big Daddy moves and attacks fluidly. Sony isn't showing or announcing any stages based on BioShock or Uncharted, but the E3 demo did have a few items from the games, including a rocket launcher from Uncharted.